On Episode #2: Angkor 101, we talked a little bit about the “must see” temples and focused on how to approach a visit, including reading up on the history, understanding the size of the park (including how to get to and from the temples), and discussing how long to visit the town of Siem Reap and the surrounding areas. We offered a few tips on avoiding the crowds, including timing your visits to temples right (e.g. not doing exactly what the guidebooks have told everyone else to do and considering going during the rainy monsoon season when the crowds are smaller, the moats are full of water, and the surrounding forest is lush and green). Angkor 101 was all about gaining an appreciation for the area pre-visit and learning some basics to make the most of your time at the Angkor temple complex. Download and Listen to Episode 27 on SoundCloud or iTunes Now! Gear: Wear sturdy shoes and a wide brimmed hat; bring sun block, mosquito repellent with DEET, and a cheap plastic raincoat (all of which, except the shoes, you can buy in Siem Reap at U-Care pharmacy or the shop next door to it). Trevor also likes to bring a compass. He generally suggests entering most temples through the front door (on the east side of the temple) and having your tuk tuk pick you up at the rear (west) exit. Sometimes you get lost wandering around and the compass will help you orient yourself. Beggars: There are many beggars, especially young children at all of the temples. ChildSafe, an organization looking out for the welfare of poor children, generally recommends you don’t give money to or buy stuff for kids as you’re encouraging them to skip school and beg/sell. Some kids will try to scam you for money by saying they’re collecting donations for school. They’re pretty much all hustlers. Trevor suggests getting a few fat stacks of 100 Cambodian Real banknotes (they’re worth around 2 cents each) and just hand them out judiciously to kids and beggars. Kids will generally pester you for more but will usually lose interest after the second handful of notes. Legitimately blind or legless beggars will be happy with a more generous handout. Read up: There are bunch of great books about the temples, including Dawn Rooney’s Angkor and Freeman and Jacques Ancient Angkor: these will give you more thorough information than any guidebook. These books also have useful maps of the temples and surrounding areas. Get Up: Get up early and head to your top attraction first. Nearly everyone goes to Angkor Wat first thing in the morning, so get up to get into the park as soon as it opens (yes, it’s still dark out then) and head to Bayon, Ta Phrom, or even temples farther afield such as Banteay Srei or Beng Mealea before the busses get there. Food: There are ample opportunities at each temple to buy cold drinks and fruit. But it’s always nice to have a little snack in your bag for an impromptu picnic, either under the shade of a tree within a temple or alongside a waterway if you’re driving along in a tuk tuk/ramork. Either put some snacks from Siem Reap in a cooler in your tuk tuk at the start of your day and/or carry some in your backpack as you’re exploring the temples. Otherwise, the best value for money in the park is actually the air-conditioned Angkor Cafe restaurant opposite Angkor Wat. Its not cheap, but the food stalls in Angkor Thom have gotten quite pricey. Trevor also likes the tourist-oriented restaurants next to Srah Srang if you must get some “local” food. 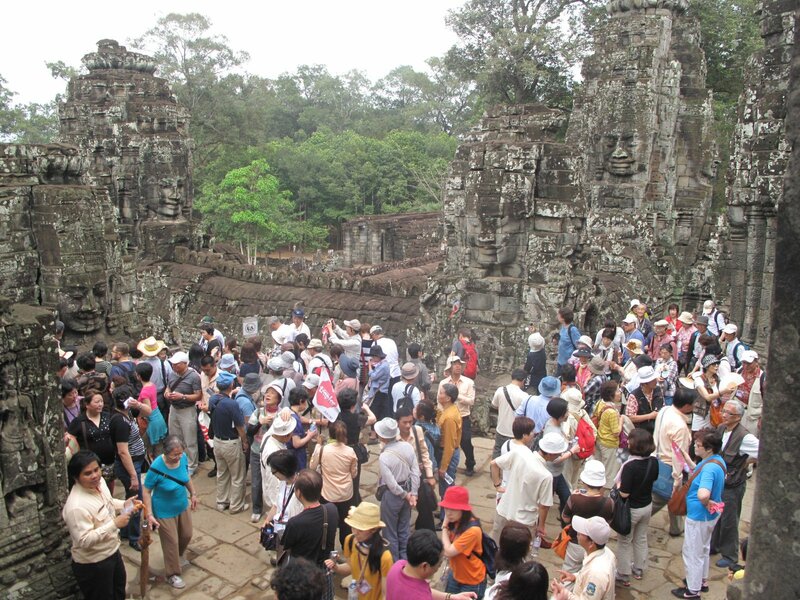 Ok, so you say you have been to Angkor before? You’ve seen all the major temples, perhaps many years ago or with a different style of traveling partner. What else is there to see? How can you get a different experience? Here are a couple tips for re-visiting the main Angkor temple complex just north of Siem Reap town. Some claim to have been to Angkor Wat a dozen or more times and always discover something new; I have come to believe that is true. 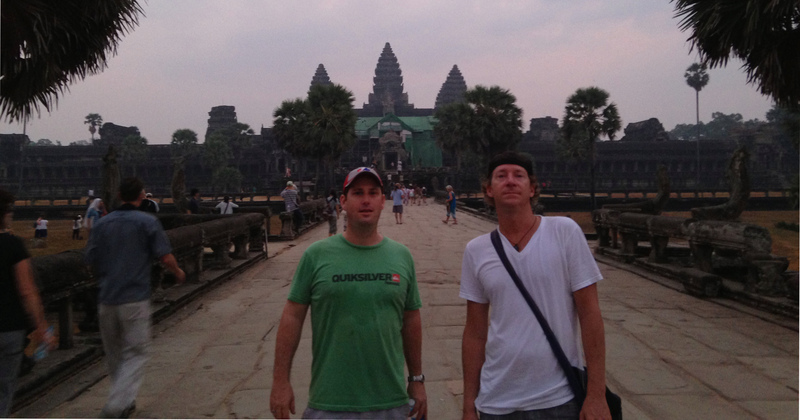 Different parts of Angkor Wat are worth checking out, aside from the ones everyone’s guides take them to. You should at least make sure to pay respects to the Kuk Ta Reach Vishnu image just to the right of the door leading into the temple complex that devotees believe contains the spirit of a powerful ancestral spirit. It was discovered in the pit beneath the temple’s central sanctuary and it’s an amazing sight, particularly at Sunset (not sunrise), which I find is the best time of day to go to Angkor Wat. Visit the two Buddhist monasteries within the temple grounds: There are two active monasteries within the grounds of Angkor Wat, one to the north of the reflecting pools and one to the south of the temple itself. While clearly less impressive than the ancient sandstone structure, the temples may be interesting to those who haven’t visited many contemporary Buddhist temples in Cambodia. The temple to the north is located near the souvenir vendors so can be a bit less enjoyable to visit, while the second one in the forest south of the temple is smaller but more peaceful. Walk around the moat: On the inside of the moat there is a grassy strip of land and numerous trees between the moat and enclosure wall. Bring a blanket and a picnic lunch, a book, and perhaps a frisbee. This is a great spot for lunch and you can also bike around most of the outside of the moat too. Ta Nei is a charming temple in the forest near Ta Keo that is ignored by most visitors, but makes a peaceful escape from the crowds. We mentioned this one in Angkor 101. It’s nice almost anytime of the day, especially when you want to escape the crowds. Just sit, listen and watch. Preah Pithu is right behind the restaurants in Angkor Thom (opposite the Leper Terrace). Hidden right under everyone’s nose, there are unique sculptures on and in some beautiful forested temples, and, to the far east of the complex, two baby elephant statues facing into the forest. Srah Srang is a fun walk around and great at sunset. You can even swim in it as that was the original purpose of the pool! Vihear Prompil Loveng & the Jayavarman VII Buddha: The Buddha image discovered in 1933 beneath Bayon’s central sanctuary was housed at this small, unassuming vihear, just off the Victory Road from the Elephant Terrace to the Victory Gate. Almost no tourists visit what is arguably one of the most important pieces of statuary ever discovered at Angkor. It is a great place for quiet contemplation. After paying respects to the Jayabuddha (remove your shoes before ascending the uppermost platform) you can walk around the back of the Vihear to capture some nice images of the Prasats Suor Proat reflected in small ponds between the Vihear and the Prasats. 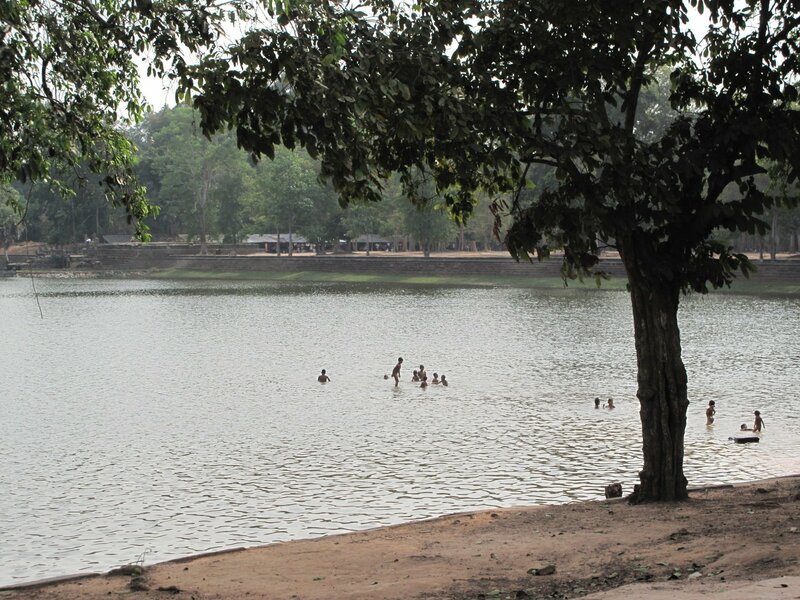 Kbal Spean, along with Angkor Center for Biodiversity, is an essential addition to a visit to Banteay Srei. Trevor wrote up a complete daytrip for these attractions in the Nation Geographic Cambodia guidebook. It’s a diverse daytrip that includes the “River of a thousand lingas” at Kbal Spean. Phnom Bok, which Trevor also included in the daytrip to Kbal Spean, is a great sunrise or sunset hike. You’re almost guaranteed to be the only one up there (except maybe some local monks who tend to the small Buddhist temple beside the historic Hindu one). Beng Mealea is 40 km east of the main group of temples at Angkor, Cambodia, on the ancient royal highway to Preah Khan Kompong Svay. The outside moat is about 800m x 1km, smaller than Angkor, but it’s one of the Angkor period’s larger temples and well worth a visit. Partially restored, it’s a nice mix between totally untouched and partially bettered for a good visit. 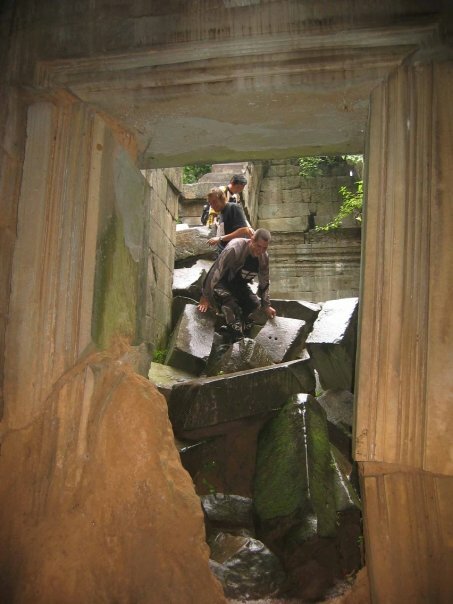 Koh Ker – Trevor likes to combine Beng Mealea with Koh Ker. While the latter was the best ‘tomb raider’ style temple for many years, the upgraded road has now made it a very popular attraction. He thus suggests you get out there first thing in the morning. Although its not completely ‘untouched’ as some of the books will tell you, its still greatly in ruins and wooden safety walking paths make getting around it easy (if a bit crowded once all the tour busses arrive). Bantay Chammar – Love it. Love. It. 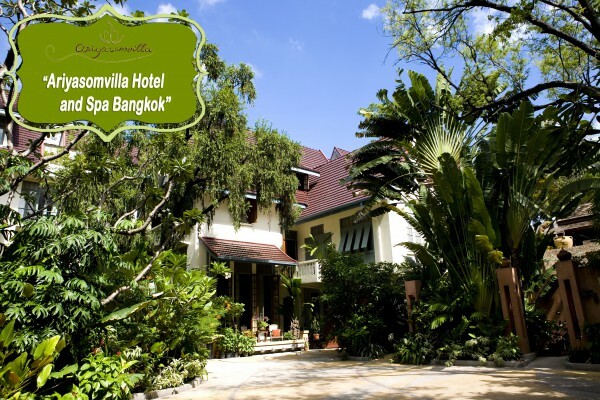 This (along with Preah Khan Kompong Svay) is your best get away from it all temple. Though Trevor hears that the road up here has gotten a lot better in recent years, when he went in 2008 or 9 they were the first people in two months to visit. Maybe you have to share it with a few more people nowadays, but it can’t be a lot and its a massive complex. There’s also a great CBET homestay program there and the town and nearby lesser temples are charming and special in and of themselves. Preah Vihear is very impressive and is easier to get to than ever before. You can combine with Beng Mealea and Koh Ker if you are really ambitious. 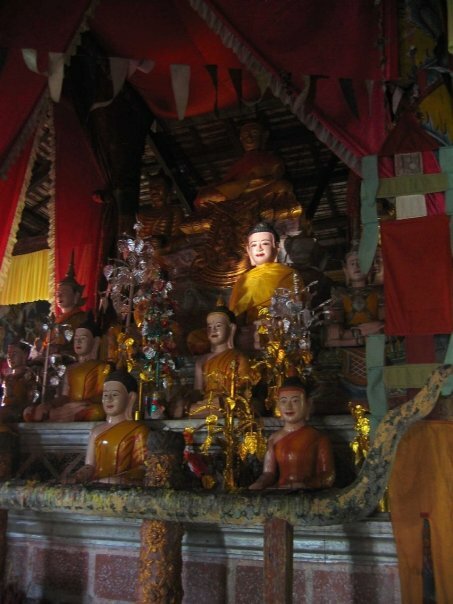 In the Nat Geo book Trevor suggested a big loop, including Sambor Prei Kuk as well, in a multi-day motorbike excursion. 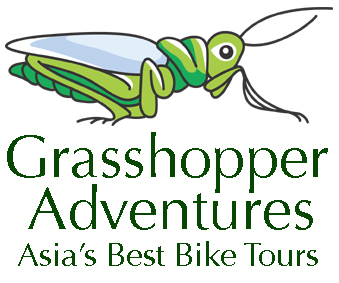 He did it with Siem Reap Dirtbikes years ago and its a great sightseeing adventure. For those who have visited Angkor before or are looking for something different I have constructed a number of alternative itineraries designed for specific types of travelers. It’s challenging to see all the sights at Angkor Archaeological Park in three days but you can get a pretty good appreciation of the major temples. The first day can be overwhelming and simply exploring Angkor Wat is best when done over a couple of visits in order to appreciate it fully. Other temples can be enjoyed at a more leisurely pace with three days and you should take the opportunity to see some of the quieter, less visited temples. Your three-day Angkor pass is good for any three days in one week, and, provided you have it in your possession at all times, you may come and go from the park as you please. With four or five days, you can really see the best of the temples without feeling overwhelmed (i.e. ‘Templed out’) as you can throw in two days of other activities in between trips to the park. **Tip** You must show your park pass at every temple you visit and it is surprisingly easy to lose. Buy some string at the Old Market and attach the pass to your neck or use it as a bookmark in your guidebook. **Tip** Bring a baguette stuffed with cheese or jam for a picnic breakfast when you find a nice place to stop and rest. 5) Angkor Wat: 2+ hours: Mural galleries and Bakan (Best 11:30 – 1:30 as the temple is least crowded at the hottest time of day). (Tip: there are some nice restaurants along the road on the north side of the pond). Sunrise: Angkor Wat – if you insist on starting your day with sunrise at Angkor Wat, then you may wish to stay there for a couple hours and explore the temple (half of the crowd will leave for Bayon after watching sunrise from the reflecting pools). Sunset: Angkor Wat – Ta Phrom is best when you are the first or last people allowed in, but there is no view for the sunset. Angkor Wat has the fewest visitors around sunset, and while the Bakan is technically closed, its occasionally possible to get a private tour of the upper chamber for an unofficial $5 ‘fee’. Alternatively, sunset from the Kuk Ta Reach Vishnu chamber, looking west across the moat is pretty special as well. This day takes a slightly slower pace and can be enjoyed over 5-6 hours in the park. The best time to follow Day 2 itinerary is from sunrise to lunch. If you opt for an afternoon start, its best to do this itinerary in reverse order, finishing at Ta Phrom and/or Srah Srang. 6) Vihear Prompil Loveng and Prasats Suor Proat: **30 minutes – See the Buddha found in Bayon temple and enjoy the Prasats from the reflecting pools behind the Buddha. 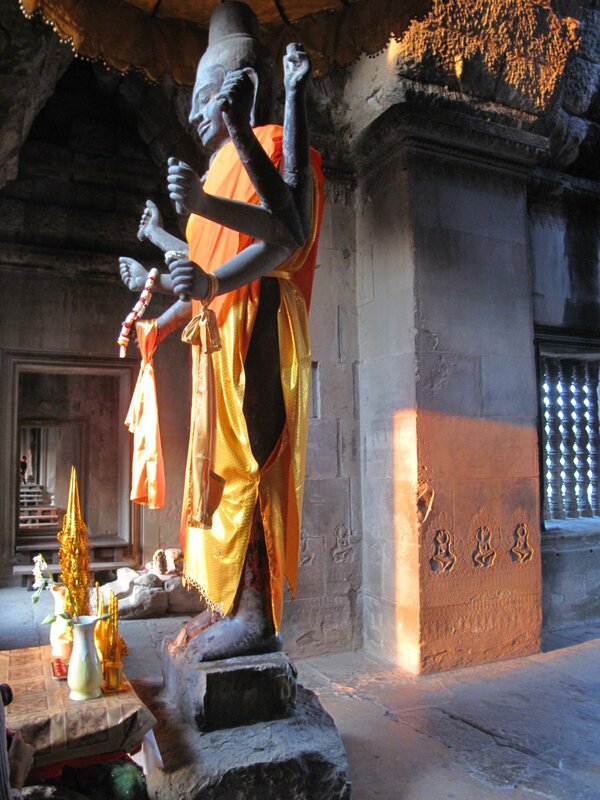 Angkor Wat – There is so much to see at Angkor Wat that it might be nice to revisit often. 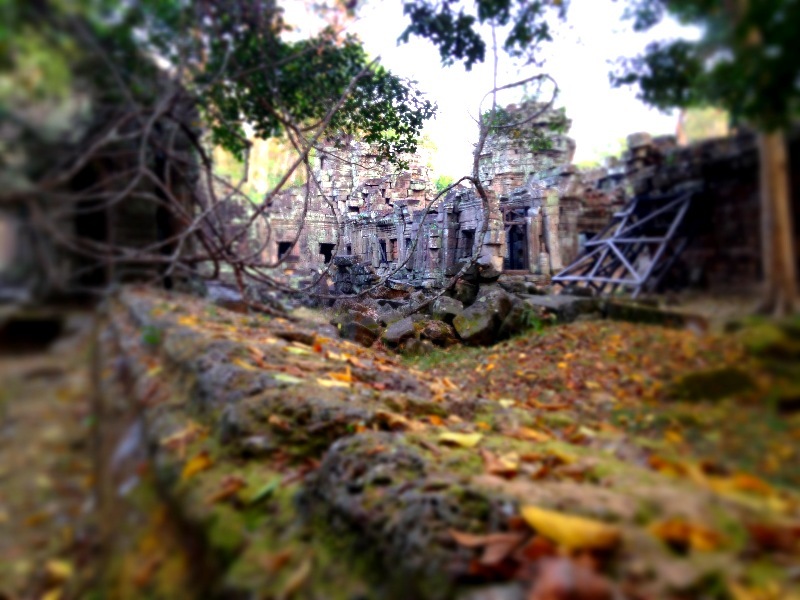 Banteay Kdei – A quieter alternative to Ta Phrom. Similar design, but with fewer tree-topped walls and towers. 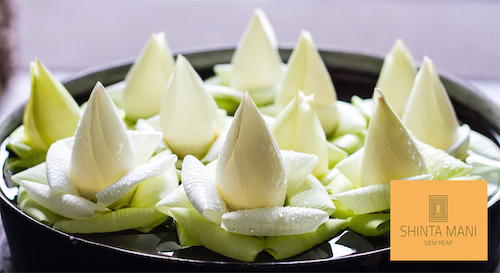 **Lunch** at restaurants north of Srah Srang – a relatively short ride from all the day’s attractions. **Sunset:** Angkor Gondola departs from the south gate of Angkor Thom and follows the moat around to the west gate of the city, where you may walk along the top of the enclosure wall to the corner shrine at the southwest corner of the city for a champagne sunset. Lunch at Restaurants north of Srah Srang – a relatively short ride from all the day’s attractions. Sunrise at Phnom Bakheng if you are a real early bird perhaps you should start by hiking Phnom Bakheng and then hustle to Preah Khan before too many others do. Visit a local village on the Tonle Sap lake. Combine a sunrise visit to the earliest Angkor-era temples of the Roluos Group with a trip to the **stilted village of Kompong Phluk, which is located just south of the earliest Angkor temple complex. With a pre-sunrise start, you can visit Preah Ko and Bakong at Roluos, spend several hours exploring Kompong Phluk, and then head back into Angkor Archaeological Park. You may also opt to visit the **floating village of Chong Kneas in the afternoon and then hike to the top of Phnom Kraom for a spectacular sunset. Bantey Srei – a day trip that combines trekking and temples with visits to various natural and cultural attractions along the way. This day could include a sunrise hike to the top of Phnom Bok and a visit to a butterfly garden, both of which are on the way to Banteay Srei, one of the most beautiful Angkor-era temples, and Kbal Spean, an adjacent site where carvings in the stone riverbed sanctified the waters of the Siem Reap River. After Kbal Spean, you may visit the Angkor Center for Biodiversity, to learn about indigenous animals, and the Cambodian Land Mine Museum on your return, finishing your day at East Mebon and/or Pre Rup temples for sunset. Looking forward to the 3 nights in SiemReap episode!! You haven’t done it yet have you? Love your podcast – thank you! Ah right you are. We need to do that!